The following is an explanation of what this project is about and how people may participate. I send this in email form to friends and I have printed copies of this that I pass it out to people I think might be interested in participating. Please feel free to copy it and send it to anybody you know that may want to contribute to Words For Warriors Project. The more submissions, the better and your help is much appreciated! At any given time in the past decade, less than 1 percent of the American population has been on active military duty. The personal toll on them and their families has been tremendous and yet they persevered. They did it for love of country, for love of family, for love of their brothers in arms. They did it for you, their countrymen and they did it without complaint. Many of us are greatly appreciative of the work our warriors have done but have few ways to express it. Some of us donate money to organizations devoted to helping our veterans and their families. Some of us make it a point to say thank you to people we recognize as veteran members of the military when we see them. Some of us participate in local fundraising events for our veterans. I want to do just a little bit more. Words For Warriors provides a unique way for us to show our veterans our appreciation. 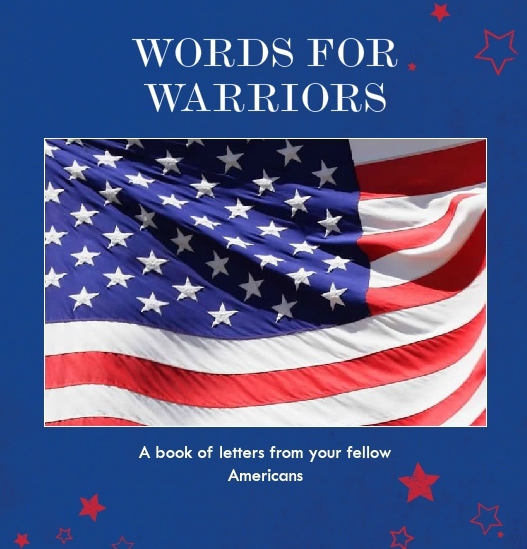 Words For Warriors is a collaborative project and a way to do something unique. I’m searching for people like me who want an additional way to express support for our veterans. I’m asking for notes of encouragement, letters of recognition, a few words cobbled together and offered to lift the spirits of our men and women in uniform. You can do this in an open letter, in a poem (your own or one you just enjoy with an explanation of why you picked it) or in a photograph with a caption. Feel free to be creative. The submissions don’t have to fit into a pre-existing template. If what we offer comes from the heart, the message will be understood. Offerings of encouragement, support and words of appreciation are precious and welcome gifts. All submissions will be posted on the blog. Once compiled, I will put selected submissions into book form and distribute them in appropriate places… in VA waiting rooms/clinics and I’ll send some to veteran’s organizations. Participants in this project will only be identified by first name and the first initial of their last name (this includes me) unless you specifically “out” yourself in your text or photos. I would like you to include a photograph of yourself or your family with your submission for publication. Along with a first name and last initial I’d like to include your age and occupation. If you’re a veteran yourself, I’d like to note that as well. I invite you to stay in touch and follow the progress of Words For Warriors. I’ve created a blog so that I can keep you informed about the progress of this project. Please stop by now and then. I will publish submissions there as they come in and keep you abreast of developments on other fronts. The start-up of this project will be self-funded but I’m hopeful that I may be able to scare up some additional funding along the way. This is an important project, one I think will be well received and I’d like to share it with as many of veterans as possible. We’ll start small and take it step by step. The blog address is www.words4warriors.com. If you click the “follow” button there you will automatically receive updates via email. Thank you, thank you, thank you for your kind support and your wonderful letter!